While this seems an unlikely question to ask a client king of the great Roman Empire, they were not asking in a complete vacuum. One from their country would soon become ruler of the habitable world. However, the Wise Men were asking the currently ruling King of the Jews where the king of the Jews was, perhaps unwisely, and no doubt Herod inferred this as an accusation that he was an imposter. Herod had been particularly paranoid at this time and mistrusted all those around him as contenders for the tenuously held throne. Instead of imprisoning these Magi for their impudence, he perceptively endeavored to determine how he could get from them any intelligence so he could to eliminate this potential rival. With what he learned from them about the appearance of the Star, as well as what his own scholars gleaned from the Biblical prophecies, Herod determined that this “king of the Jews” was no more than two years of age and living in the nearby town of Bethlehem, the City of David, just 6 miles away. By this time, Herod had been ruling already for over 30 years. First, he ruled as governor of Galilee when he was a young man in his twenties, then as tetrarch under the Roman leader Marc Antony. Due to a local disagreement with his uncle, Herod fled to Rome. While some might think that Judea was a third-rate province on the edge of the Roman Empire, it played a role in Roman politics due to General Pompey having conquered Jerusalem in 63 B.C. While in Rome, Herod was appointed “King of the Jews” by the Roman Senate itself. However, Judea was not quite a Senatorial province, nor was it an Imperial province ruled by the Emperor, rather it was considered a satellite of nearby Syria, a more important province at the time, ruled by a prefect. This distinction would play a significant role in the Easter story and the fate of Pontius Pilate. When Emperor Augustus came to power young Herod had been a competent ruler as vassal king over Palestine. His family had the had a particular genius in being able to tell which way the wind was blowing as it related to Roman politics in his territory, and make shrewd decisions. For example, his father provided critical aid to Julius Caesar in Egypt when his supply lines were cut, and the Roman Emperor rewarded him richly. Years later when Mark Antony came to see Cleopatra, young Herod himself urged him to make his peace with the remainder of the Roman Triumvirate (Augustus and Lepidus) — advice Antony ignored to his peril. Herod knew Cleopatra well; they’d had a business monopoly that extracted asphalt from the Dead Sea. Later, when Augustus succeeded Julius and saw success through the civil wars, he made Herod one of his most trusted friends. We learn from the Jewish-Roman historian Josephus in his book The Jewish War that Herod beautified the larger Palestine area during his 33-year reign. He spent lavish sums to build for his people temples, aqueducts, cities, and for himself palaces and fortresses — like Masada, north of the Dead Sea, pictured above. 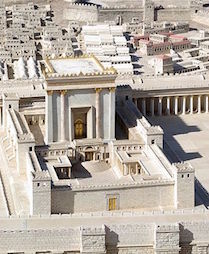 No doubt his greatest achievement was the construction of the Second Temple in Jerusalem, pictured at left, to replace the older destroyed Temple of Solomon. Part of that remains today, most notably the Western (“Wailing”) Wall of the Temple Mount. In honor of Augustus, Herod built the remarkable port of Caesarea. 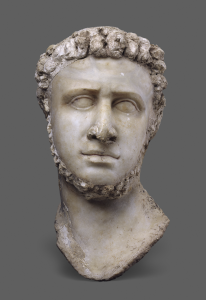 In addition to stimulating commerce and trade, he patronized culture in many cities in the eastern part of the Mediterranean and was a sponsor of the 12 B.C. Olympics. It was not only a play on the similar sounding Greek words for son and pig but a wry observation that the Jews, at least, do not consume pork. I’ve enjoyed reading your blog. It had light humor and a lot of information. I am writing a scene for our christmas drama in church and found you blog very helpful. Thank you to the friendly neighborhood historian. Thanks for the enlighting truth about Herod The Great. Very well written and articulated in detail the deeds of the man. Learnt a lot about him.